I think this answers the previous questions about why there is still a need to buy additional air rights. 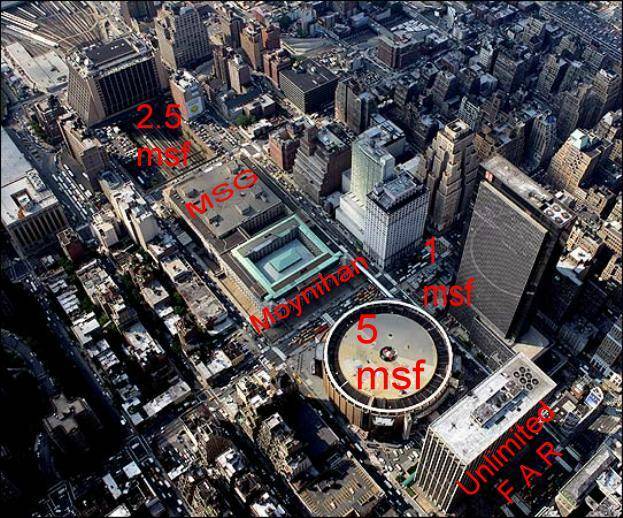 According to this photo, there is only 2.5 msf allowed at the Brookfield site and to get the additional 2.2 msf (to make 4.7 msf), they would have to be transferred from another nearby site. No particular reason the developers couldn't have done that a couple of weeks ago. The politicians get a lot wrong, but when they get something right, they should get the credit also. A bit off topic, but that photo makes it crystal clear: the Garment District has got to go. Look at the fall-off in height when you move south of 40th street between 5th and 8th avenue. That's because of the garment restrictions and the manufacturing zoning on the mid-blocks between 34th and 39th. All of this to protect several thousand jobs that could be done at 1/10 the cost in China. Amazing. I'll bet there are more office workers in the Empire State Building than garment workers in all of Manhattan. Seems like 8th avenue and the Penn Station area will provide the land for midtown expansion for this cycle, but looking ahead several decades, Midtown proper has to extend into the Garment District. I'd rather develop railyards and empty lots before ruining one of NYC's last remaining manufacturing and merch. districts. The garment district is filled with fantastic buildings from the 20s & 30s that are being renovated / re-used for small companies / residential. Get rid of the garment district? What a sad thought, and not entirely far-fetched. NYC is becoming more and more homogeneous every year. All of this to protect several thousand jobs that could be done at 1/10 the cost in China. Amazing. I really hope that you are not from the USA. Cuz if you are it is a lamentable display of disregard for you fellow countrymen's livelihood and promotion of another country's economy. Let me ask you something, do you live in this country or are you vouching to get this job in China?? i think his problem is a mere misconception of what the garment district is - it's not the sweatshop central it might have been, but rather it derives its economic and cultural importance from the presence of designers, showrooms, fashion schools, etc. (and of course there are a lot of great old structures in the area). last i checked what you get from china are knock-offs (albeit of increasing quality), not high fashion. that said, a great way to guarantee the integrity of the greater area would be to land big luxury goods makers as anchor tenants for the brookfield site. Send him to a Nike factory in China. I think we will always have a Garment District to some extent, to make samples and also one of a kind items like theatrical costumes. 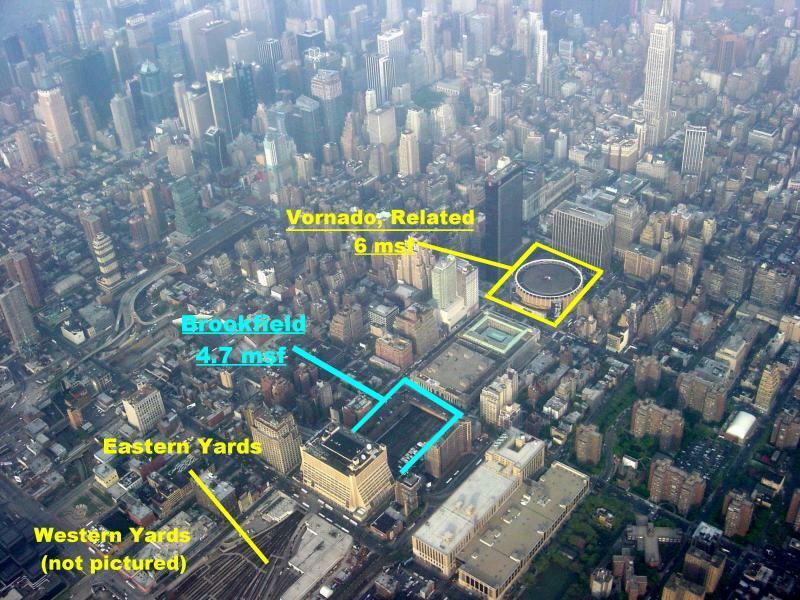 Combined, the Brookfield and Related/Vornado developments will hold more space than the WTC. 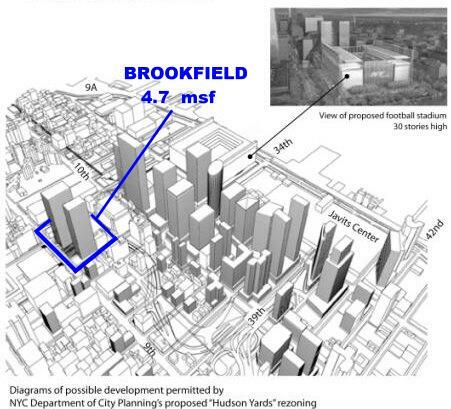 It will be interesting to see if Brookfield or Related gets the jump on materializing their plans. Whoever begins first will have the upper hand. Yikes. Didn't mean to be so contraversial on a off-topic comment. All I meant to say was that the land is too valuable to be used as a manufacturing district, given its transportation assets. I think its demise is inevitable. After all, there used to be slaughterhouses where the UN is. If there's more money to be made from offices than garment showrooms, then eventually, some politicians will let it happen. As for the jobs thing, I make no apologies. If we tried to preserve every job that exists in America, and had that policy hundred of years ago, then a lot of us would still be candlestick makers, horse buggy drivers, blacksmiths, etc. Point is, times change, and the vast majority of the US workforce is too educated to be wasting time producing undergarments. Would you want your kid trained to do something like that? No, you prepare them for fast-growing, knowledge-centered jobs, the kind that are in abundance in NYC and need office space (finance, RE, advertising, etc.). There are plenty of people in the world who can produce our clothes cheaply, and leave us to do more skilled work. The unemployment rate in NYC right now is very low, after all. I find this topic interesting, but it doesn't belong in this thread. Perhaps a moderator can steer this over somewhere else? Before I get hit with personal comments: yes, I'm American, I'm an economist (hence the bias), moderate politically, and both my grandmother (full-time) and mother (part-time high school) have worked in the Garment District on sewing machines. Yes, perhaps 30 years ago jobs like this supported working class NYC and helped my family move up in the world, etc. But Regent's scholarships helped a heck of a lot more. And if anything, these jobs should be helping people in rural Alabama move into the middle class, where the cost of living is cheap, not Manhattanites who can't live on a garment workers salary anyway. I'm shocked at the protectionist sentiment here, since China's role in the world is an unqualified positive for New York's real estate market. Without China's help in keeping inflation and interest low, there wouldn't have even been a housing boom in the US in the past 5 years (certainly, our own federal deficit spending policies would have driven interest rates higher without their help in keeping them low). Instead of pesonalizing things, read an economics textbook before you question someone's patriotism without understanding how the global economy works, since New York is very salient as a beneficiary of it. (maybe the midwest could have misgivings, but New York clearly is a winner on China). Having said that, I don't see a lot of open space in the garment district that provides the kind of wide open opportunity that the rail yards do. They should be rezoned to permit alternative uses and the repurposing of existing interesting buildings, but that's already happenning anyway.